Let’s be honest: half up half down and bun hairstyles are total lifesavers. They are the perfect pretty hairstyle solution to look nice on the days when your hair just won’t cooperate or you’re short on time. Elegant hair ideas that incorporate bun hairstyles, braids and half-up-dos are easy to master any style of hair cut – short, medium, or long. If you have short hair, bobby pins are key to pulling off bun hairstyles. You probably have layers that won’t make it all the way back to a hair tie, so meet them in the middle with bobby pins. If you have medium hair, make sure to use texture spray, especially with half-up styles. Medium hair (cuts with layers in particular) can look a little thin in bun hairstyles and texture spray will add volume. If you have long hair you’re in luck. You have the most versatility when it comes to bun hairstyles and updos, and you have enough length that half-up styles don’t look thin. Play around! Using a bun donut can work wonders for getting medium length hair into bun hairstyles. and it’s handy for long hair, too. These accessories create a flawless bun shape and stay in place surprisingly well. Start with your hair in a ponytail and thread it through the donut. Take the donut to the ends and wrap the ends around the donut and toward the middle, being careful to get even amounts of hair all around it so it doesn’t peek through. Keep rolling down toward the base of your ponytail and secure with pins. 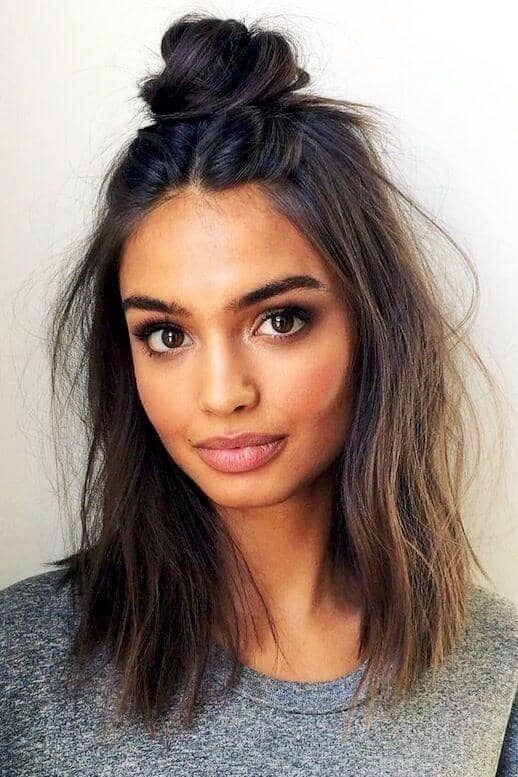 You can start with clean, straight hair and keep it just so for a sleek bun, start with “day 2” hair and pull on some pieces to create a tousled look, or start with curly hair to create perfectly undone curly bun updos. However you like your bun hairstyles, just make sure to check in the mirror so that your hair covers the entire donut. Check out some of the best hairstyles we love for 2018. 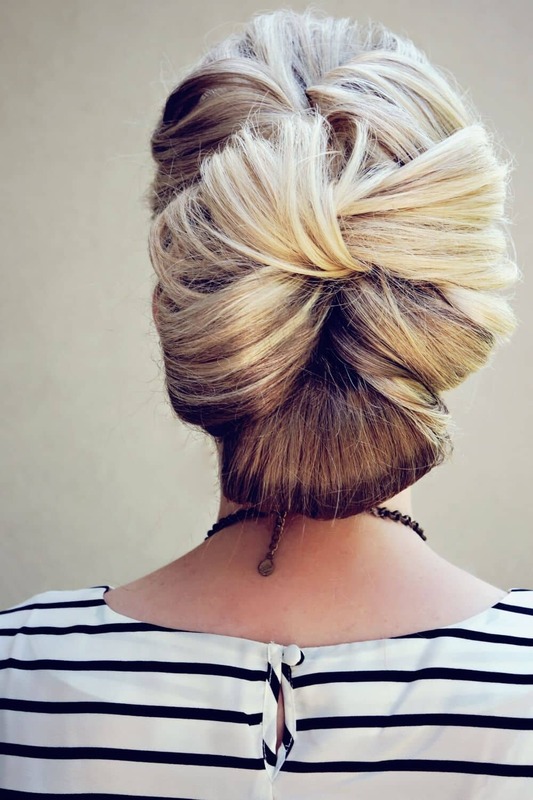 This big, messy bun is a go-to hairstyle for any occasion. A step by step guide is also given in this tutorial so that you can learn easily how to make this bun. The elegant, party styled bun by Tonya stylist is you hairstyle for any party. A glittery hair accessory tied on one side of the bun can enhance your look and overall appearance. This messy bun featuring Janna Yaromich is perfect for ladies with short hair. You can curl up your hair before tying them in a bun as shown in the tutorial. This style can be suitable for long hair as it requires the twisting and curling of long strands of hair. If you have slight waves in your hair, you can adopt this style. If you are willing to spend a day with your family on a beach, then this bun idea is good for your beach day. 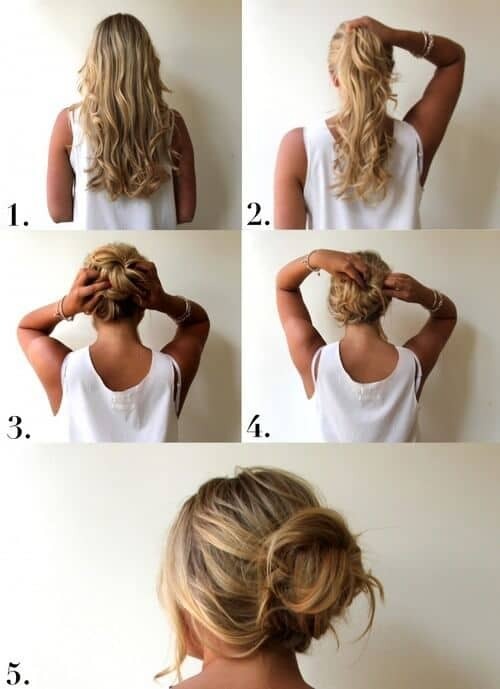 All you have to do is bring your hair to the front, twist them, curl them on your head and tie them in a bun. The bun idea with two little heads on top can be a perfect pick for funky girls. You can carry it with a funky appearance for a party or on a day out with your girls. 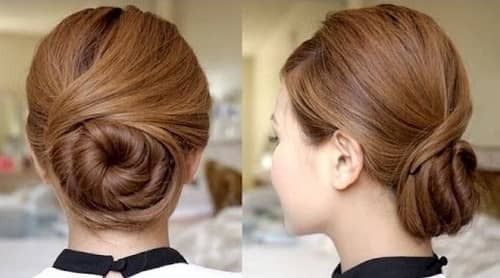 This bun idea with a braid wrapped around it is easy to make and fun to carry around on any occasion where you prefer to show your sophisticated and classy look. 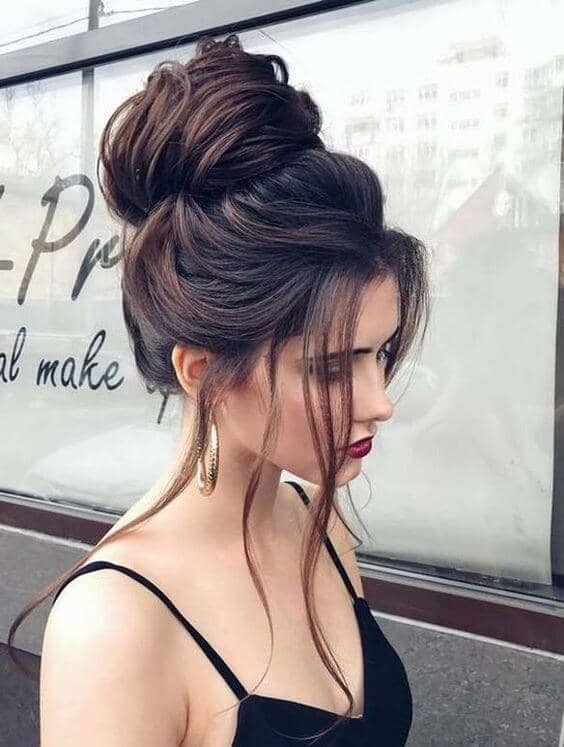 Sway your day with this loose bun in which you can first brush your hair, give them loose curls and tie them in the shape of a bun with the help of pins. If you want a relaxing day all for yourself, try this look where you can get ready within a few minutes with this idea. You have got a holiday and you are inviting your friends over. We understand you have got a lot of work to do and very little time to get ready, this hairstyle can be made very quickly and is the perfect home look. 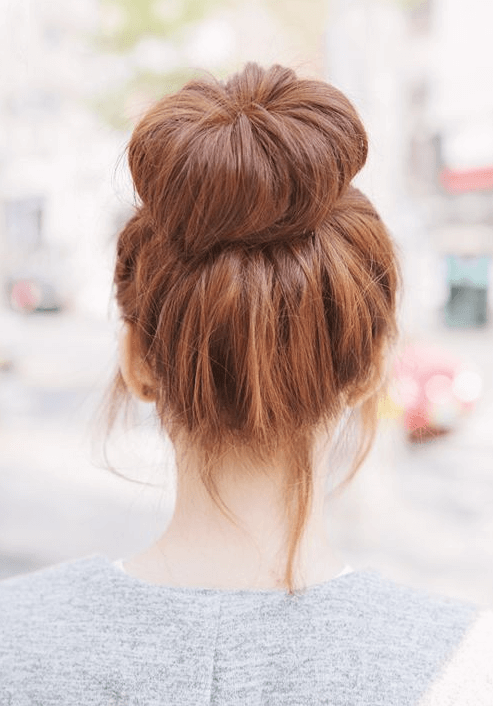 If you don’t get enough time to put a lavish hairstyle each day for office, you can try this simple bun that can be made easily in just two minutes. The high top bun can be made with the help of a hair shaper and hair are tied around it to give a hump type look on the head. Good for girls who follow high fashion. Although this hairstyle looks a bit difficult to make yet with a little practice, you can have this different and stylish look which is suitable for parties and occasions. The plaited updo braided bun is an easy hairstyle that you can do yourself. Bobby pins will be required to keep the hair intact. Twisting the two braids together can give you this look. The moon inspired bun is a must have in your collection of hairdos. 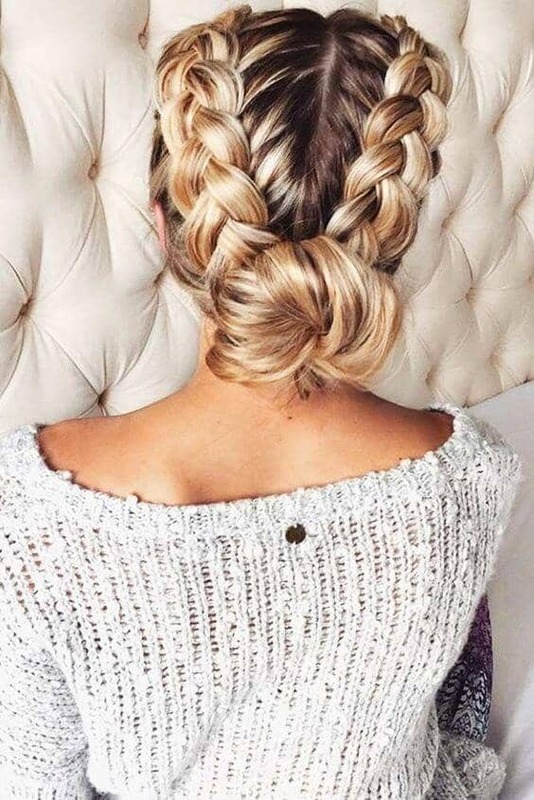 It is quite a unique hairstyle that you can carry with friends and family. The wedding bun as shown in the above picture are perfect for the elegant brides. These buns can be made both in summer or winter brides. This classy bun in the form of a bow tie can be your favorite pick for your sister’s or best friend’s wedding. This is the bun style that any bridesmaid will love to adopt. That’s the kind of a style you can wear on your official meetings and commitments. It’s sophisticated, stylish and elegant. It reflects your exquisite personality. If you want a messy, sloppy or cluttered look, you can make this bun hairstyle that can be worn for any occasion in any weather. It can be made easily on long hair. This hairstyle depicts a very cute and refined personality. This look can be opted on occasions such as parties, weddings and get together. French braids are the childhood memories for those ladies who loved to tie their hair in the form of French braids. These grow up and updated version of French braid in the form of a bun is perfect for summer weekends. The Dutch braid bun is for those who love to do experiments with their hair. They can make this hairstyle by first making a dutch braid and pulling up the hair in the ponytail. This hairstyle is a casual knot top with a heavy one-sided bang looks incredible. It can be made easily and look super stylish and chic. 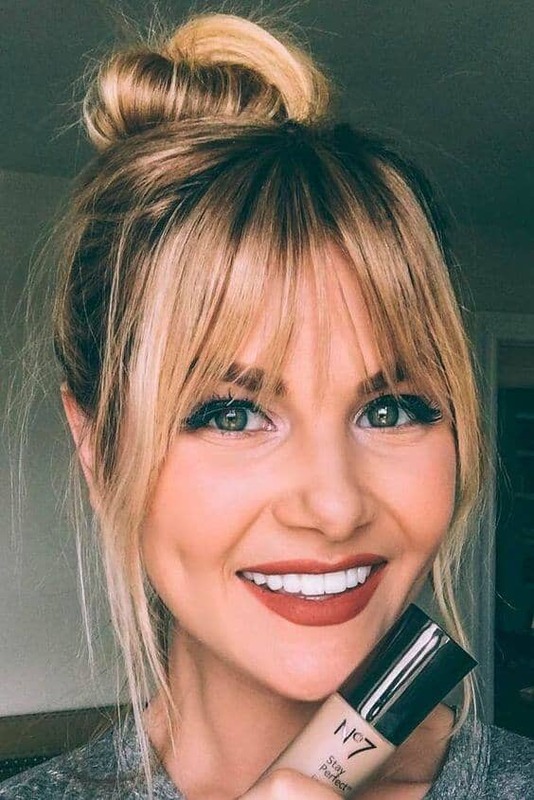 Are you drooling over Amber Fillerup’s look in the photo? You can adopt this hairstyle with ease and comfort. It looks super casual yet stylish for any occasion. The two back to school look is great for long to medium sized hair. You can make it by twisting your hair from both sides of your head and turning them into two short buns. 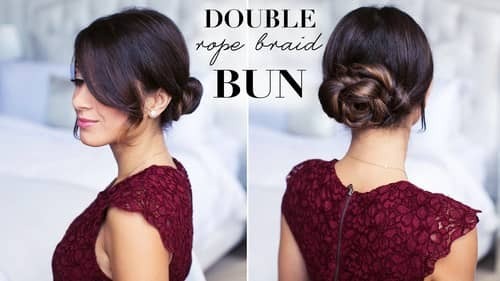 The double rope bun looks suitable for hair that is long and healthy. You can easily make this hairstyle by watching the video tutorial given in the link that gives you a step by step guide to this hairstyle. If you truly love braids, this one-sided big braid bun can be your favorite pick among other bun hairstyles. You can try this style with the step by side guide given in the link. The high-end rough bun on the top of your head can make you look amazing on any occasion. You can style it up with the help of hair bun shaper that is readily available in the market at a very low price. 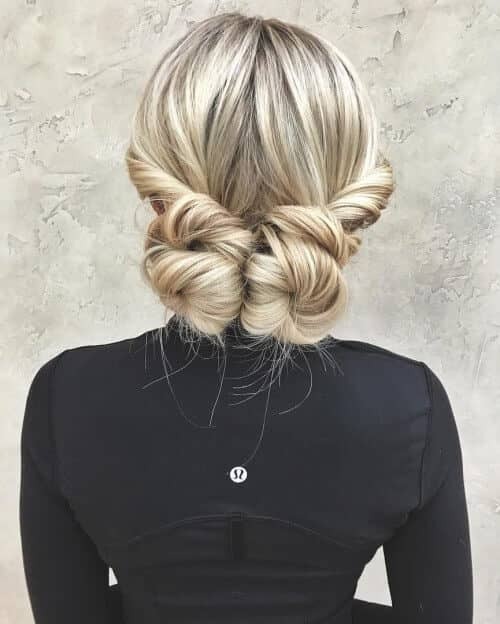 The double braided bun look is very unique and stylish. You can ask a friend of yours to help you with this look and can go out with her on weekends with this stylish appearance. This bun hairstyle isn’t really difficult as its name. It gives a simple yet elegant look that can be used for evening and late night summer gatherings. This style can opt for a relaxing weekend where all you want to do is Netflix and Chill. So, grab a bottle of champagne and glue to your TV in this relaxing hairstyle. You can try this bun not only for your wedding but also for a friend’s wedding. It is sleek and beautiful. Putting hair accessories can further enhance the overall appearance. The space bun is funky and offbeat. You can wear it on costume parties and nights at the bars with your friends where you want to be a fashionista. If you are a busy girl and gets very less time to get ready for any occasion then this quickly formed braid bun can save a lot of your time. It only takes five minutes to transform your hair into this bun. This is another great and stylish hairstyle for busy girls. The tutorial can be learned easily and you can also easily modify it and make your own style. 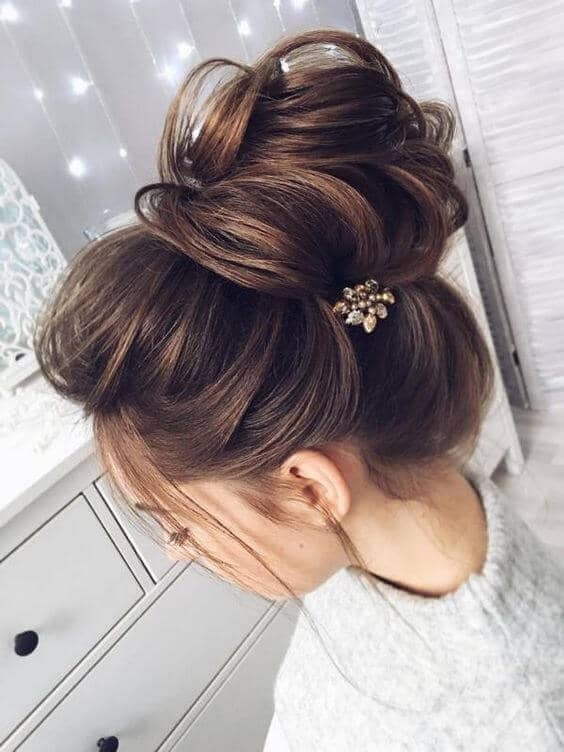 This two buns hairstyle is a young look that would be perfect for a teen, or for those days when you’re doing boring stuff but still want to look cute. Just part your hair down the center with your fingers (no precision required). Separate the 2 sections of hair using a hair tie. One at a time, create a ponytail just behind the ear, fold the hair into the hair tie, and fan it out with your fingers to create your pigtail buns. This is another cute hairstyle idea that doesn’t require precision styling. The half-up ponytail is created with hair pulled back from around the forehead. Use one piece at a time to loosely twist around the pony and secure with a pin that makes the bun hairstyles. Using sections that start underneath the half-up section, create a single braid and secure it with a poly hair tie. Then loosen it up with your fingers to create the tousled look. This is one of those classic cute easy hairstyles that you can always fall back on. Unfortunately, it doesn’t work for medium length without a ponytail base, but its a pretty easy adaptation. Start by pulling your hair up like you’re making a high ponytail. Instead of putting in a hair tie, twist the hair. Keep twisting until it creates a bun. Secure with a hair tie and pin in any loose pieces. This is a really lovely (and quick) way to elevate a basic bun. Start by creating a face-framing crown braid from your part, and from your ear down just braid the hair without adding pieces. Make another braid at the base of your neck. Leave the nape braid out, and make a low ponytail with the rest of the hair plus your crown braid, folding it on itself to make a messy bun. Use the nape braid to wrap around the elastic on your messy bun and pin the end underneath. 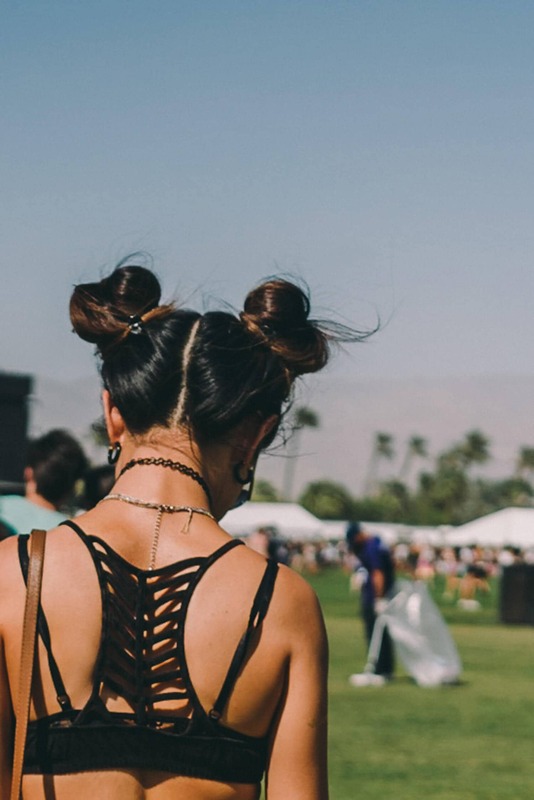 This is a classic updo hairstyle that’s a low-maintenance for festival fashion. And it’s so easy! Part the hair using a comb. Create two high pigtail ponytails. Twist and wrap the hair around each ponytail into a bun, and secure at the back with a pin or clip. Perfect double bun hairstyles! It looks complicated, but this is actually an easy bun! First, tease the hair at the front. Create a high ponytail and pin the front layers back as close to the hair tie as possible. Don’t pin it back super tight so that you leave some volume in front. Thread your ponytail through the donut so it’s at the base. Let your hair fall evenly around the donut, then add a second hair tie to secure your hair over the donut. If you have super-long hair then definitely give this hairstyle a try. This is such a cute hairstyle to go with a dress or flowy top. Make a low side ponytail. Twist and tie your hair into a knot. Secure the pieces with pins. Then use your fingers and/or a tail comb to loosen up individual pieces and give it texture. This is a cute hairstyle for a french braid bun that is so pretty and simple. It can work for medium or long hair. Create a loose crown braid from your part at the front around to the nape. At the nape, pull the braid into a low ponytail and fold into a messy french braid bun. Add flowers or hair accessories to make the style your own. 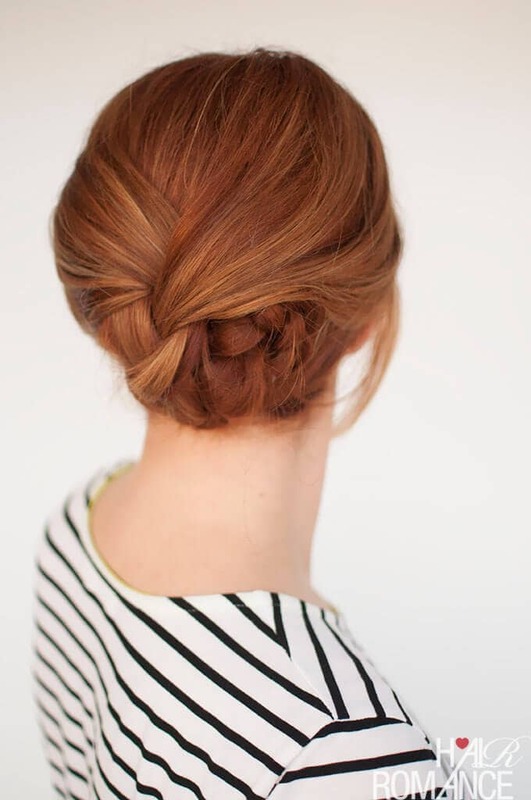 Of all the bun styles this one is classic, timeless, and such an easy hairstyle. Let’s just call it what it is: the perfect bun. Best of all, its beautiful for medium or long hair. Start with a high ponytail. If you’re using a donut you can pull it down to the base of the ponytail and wrap and pin pieces of hair around it until its covered. Otherwise, just twist and wrap your hair around the base of the ponytail, and use pins to secure the bun in place. 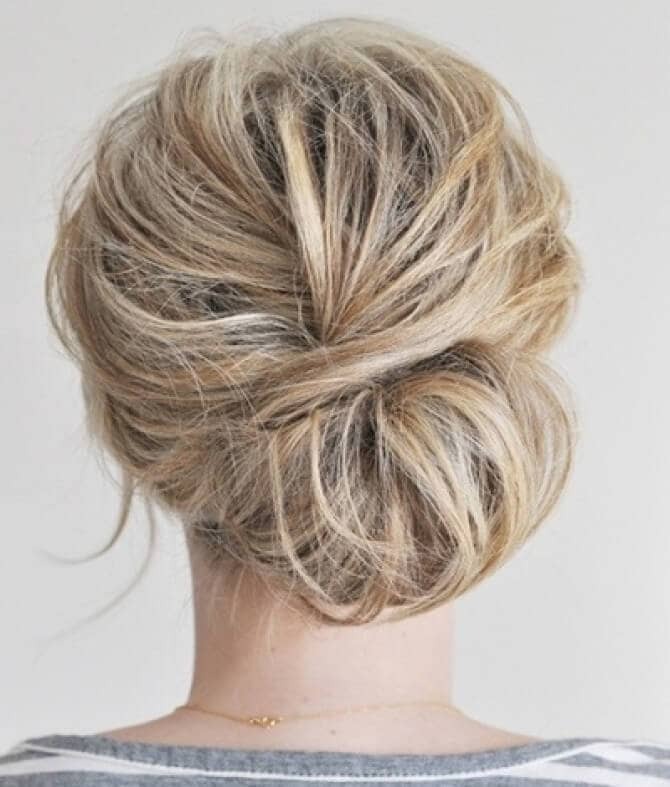 Who doesn’t love a perfect chignon? This particular style is perfect for 2nd-day hair. Use a volume and/or texture spray and tease around the crown. Split your hair like you’re pulling half up, and clip up the top half. Tease the bottom half, then loosely pull back the hair into a low ponytail, folding the hair over one time and fanning it out into a bun. 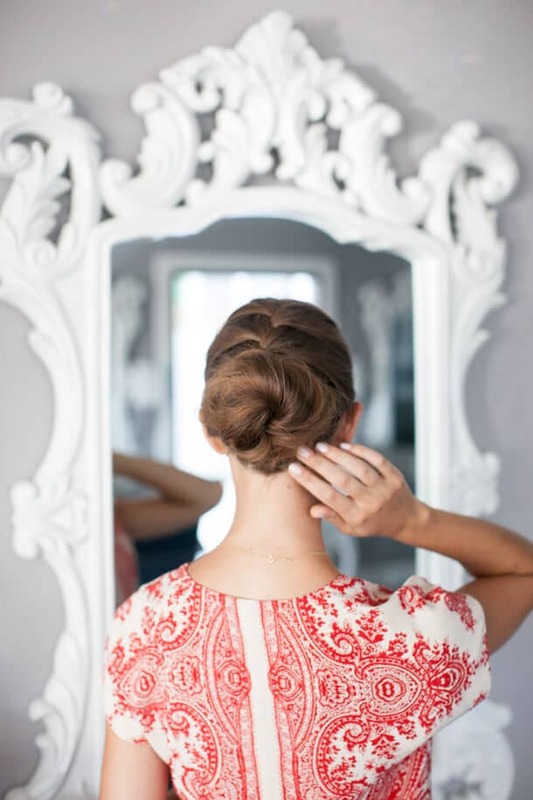 Of all the bun hairstyles here this braided bun is the fanciest for an upscale formal event. 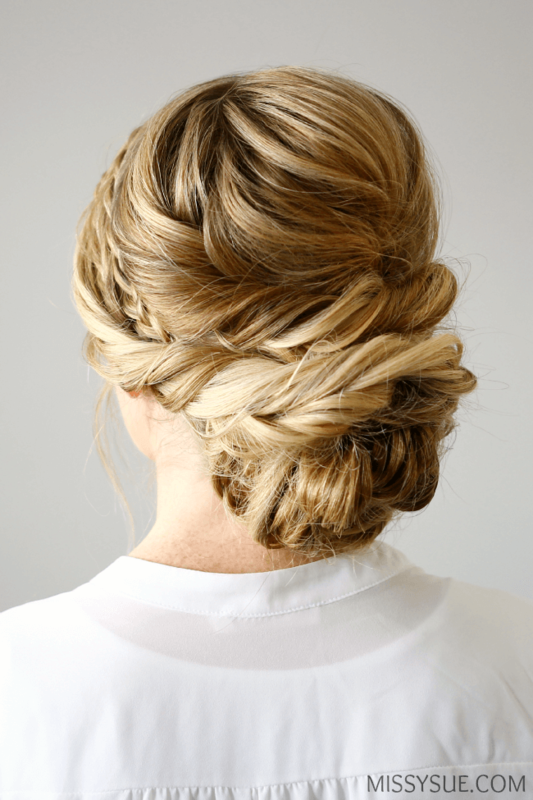 This hairstyle idea uses layers upon layers of twists and braids to create a gorgeous bun. The crown is teased up and pinned to keep the volume. The first layer rolls in a loose twist from front to back. Then there’s a braid, followed by a larger loose twist underneath that. Each layer crisscrosses in the back and is pinned under the low bun. This is top knot hair at its finest. Taking a small section of hair, pull it up into a loose half-up ponytail. Make sure not to pull it too tight, and don’t worry about clear-cut parts, This is supposed to be a little “undone”. Twist and wrap the hair in a bun and pin it into a high bun. Rough up the bun a little bit with your fingers. The rest of the hair has a loose wave. Any bun styles really work for work, but this one is no-nonsense and nice and easy to do. Start with clean straight hair. Pull in into a low ponytail and twist into a bun. You can secure a bun like this with the hair tie or use pins. Your hair doesn’t have to be straight for this look. You could easily make a curly bun with wavy or curly hair for a similar effect. 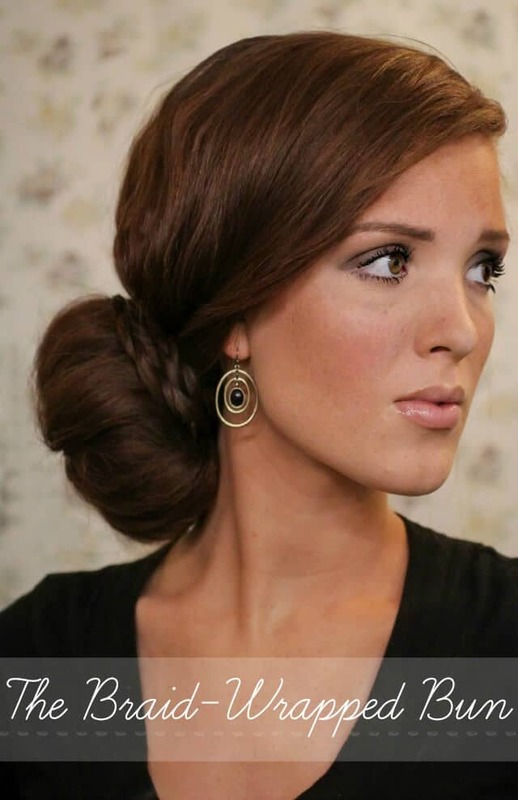 The elegant chignon style bun style of hair is surprisingly easy and such a nice option for a simple updo. Start with hair half up. Take the bottom half and pull into a low bun. Loosely section the top half into two pieces – right and left – without parting them. Gently twist the left side and wrap around the right side of the bun. Do the same with the right side. 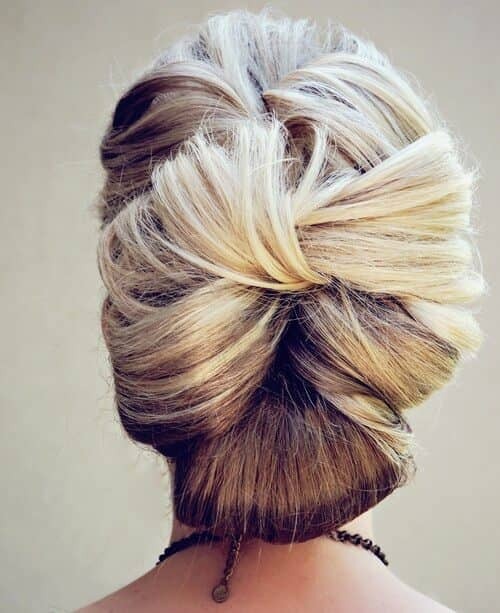 Think of this amazing updo for long hair as 3 hair ideas rolled into one. There’s a chignon at the base, a rolled ponytail at the top, and a bow bun style in between. The effect is a pretty, voluminous updo that’s awesome for a formal event. Make sure you use plenty of firm hold and shine spray! There you have it! Cute easy hairstyles for every occasion and day of the week to update your style for 2018. If you have long hair just jump right into these hair ideas. 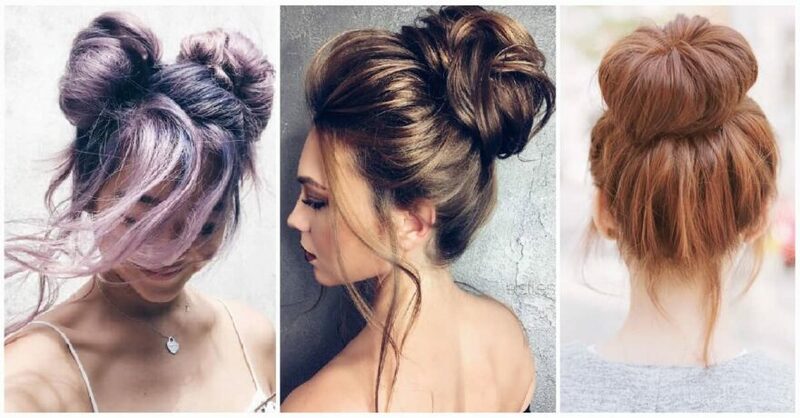 If you have short-to-medium hair you may need some adjustments (and a few extra pins) but a bun is one of the best ways to create the illusion of a longer style of hair. Take a Saturday morning to practice the best hairstyles for you to get your technique just right. Once you get the hang of it, you’ll be amazed at how quickly you can create these elegant hair ideas for an awesome, polished pretty hairstyle in a snap.